The latest submission to the forthcoming book is from Martinpfirrmann via our Flickr Pool. This is an interesting one, in Martins’ words – Imagine building an elevated highway over Pont Neuf, Pulteney Bridge or Ponte di Rialto? 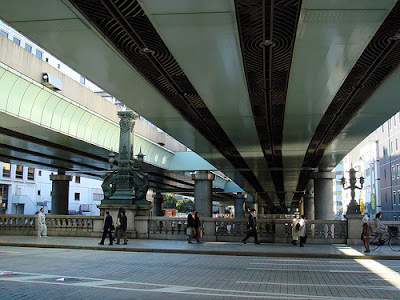 Well, Tokyo did this to its “Bridge of Japan”. Nihonbashi was first built in the center of Edo in 1603. The area around Nihonbashi was the major business and financial district until the 20th century. The bridge is the origin of measuring distances for all places in Japan. Since then, it was rebuilt about 20 times; today’s renaissance-style stone bridge was constructed in 1911. Only in 1999, it was designated as a cultural asset. Though being a significant element in Japanese history, shortly before the Olympics in 1964, the elevated Tokyo Metropolitan Expressway was constructed over the bridge. Plans to remove the highway are without progress. The historic monument, located close to the exclusive Ginza Shopping Area rests in the shadows of the highway. The official Tokyo sightseeing guidebook does not even mention it, and if you pass over the bridge today, you would hardly notice it at all. If you would like to contribute it is easy, simply go out into your local urban environment and photograph anything that you think is an example of poor architecture, urban design or use of space. It could be a photograph of a run down phonebox or a disused building, perhaps a concrete monstrosity from the 1970’s or anything that you think fits. Once you have your photograph you can simply upload it to our newly created group on Flickr, Worlds Worst Urban Spaces and Place including a description of between 100 and 250 words. Its as simple as that, see our previous post for full details on the book. So it’s a “disaster that puts a whole nation to shame”? If you’re going to edit posts like you said, why not take out the stunning hyperbole and make this project readable and credible? Its an evolving feast and yes i do agree in some part but my first thoughts were to edit text mainly when formatting the book based on comments from the posts. Web 2.0 is user based content and i dont want to hold a heavy hand with editing on the blog posts as it is based on peoples views and their words. Each post states that the text is from the person submitting. I’m happy to go with opinion on this one but at the moment i’m on the side of the peoples voice rather than notable editing for the blog posts. I agree, the ‘peoples voice’ is important – it’s all opinion-based after all. I like the idea of the book containing some sort of summary of the conversations and links that gather on the comments though. Phrases like the “disaster that puts a whole nation to shame” were used when plans were displayed in the 1930s for a suspension bridge over the Golden Gate in San Francisco, and when an elevated freight railroad was built from 34th Street to Gansevoort in lower Manhattan. Now the first is one of the most beloved constructs in the nation, and Friends of the High Line have fought successfully to prevent demolition of the old freight El in NYC. It is amazing how aesthetic assessments can change over the years. sorry for including some personal emotion in my discription. as my name is right next to this text, i have no problem with my opinion. choosing the “worlds worst urban spaces” is basically about criticizing urban planning and/or architecture, and not about praising spaces. even the selection will be highly subjective. in the end, if you really care about urban spaces (like i do), some clear words should express this. andy, maybe some more guidelines are needed for the book? Imagine building an elevated highway over Pont Neuf, Pulteney Bridge or Ponte di Rialto? Well, Tokyo did this to its “Bridge of Japan”. I personally feel that emotion is good for such issues as it is a personal choice and i would like to err away from too many guidelines if possible. I have changed the text to Martin’s new submission – thanks Martin. As such i think the comment posting has been really useful.